Pets make our life happier and we can try our best to return this love to them. Taking care of our little friends takes time, but its so rewarding. Besides, various online stores can facilitate this noble mission and provide you with all the necessary products. Positive atmosphere and nice visuals of lovely animals make such stores pleasant for visiting and drive people in. Here is a design perfectly tailored for a store offering a variety of pet products. Its bright color scheme with optimistic red, orange and green colors welcomes people in, while large readable fonts, wellstructured layout and intuitive navigation make site browsing seamless. Try this theme as a basis for pet store, and you wont regret it. Online chat relates to any type of communication that arises over the Internet within the real-time. On-line chat stands out as the most reliable solution to build interaction with any visitors and turn them into your customers. Bootstrap is a freely available front-end framework that creates for faster and easy website development practical experience. Bootstrap scales any of your websites from mobile phones to desktop computers employing the same codebase. It makes the web developing process efficient and effortless. Responsive design ensures that the webpage adjusts its size and shape to fit any specific display screen, from the smallest phones to the widest Computer displays. For every single device, web page elements get bigger or scale down to appear ideal. Because of the growing fascination with mobile devices, the amount of individuals who log on to the internet sites from cell phones has grown a lot. This sort of functionality permits you to adapt websites to smartphones and diverse screen extensions, eventually providing mobile device owners with improved opportunities. SEO enables to reach the top of search results and fit the ranking factors necessary for the most popular search engines. Because of thas your website is visible on the web. Can I resell the customized Pet Shop PrestaShop theme? No, you cannot resell the customized Pet Shop PrestaShop theme as a template but you may sell it as a project to your client (see paragraph 1 ONE TIME USAGE LICENSE for more details). Can I resell the PrestaShop design for Pet Clothes Shop as is? No, you cannot resell the PrestaShop design for Pet Clothes Shop as is. Do you provide any scripts with your PrestaShop templates for Pet Accessories Shop or could you do some custom programming? Our templates do not include any additional scripts. Newsletter subscriptions, search fields, forums, image galleries (in HTML versions of Flash products) are inactive. Basic scripts can be easily added to a PrestaShop ecommerce template for Pet Store at www.TemplateTuning.com If you are not sure that the element you're interested in is active please contact our Support Chat for clarification. In what cases I don't need the extended license for Pet Boutique PrestaShop design themes? Are there any limitations on selling the PrestaShop design for Pet Clothes Shop as the integral part of my new product? What is Extended License for PrestaShop design theme for Pet Shop Supplier ? Can I put low resolution thumbnails of PrestaShop ecommerce templates for Online Pet Shop on my website for my clients to choose designs? I have customized the PrestaShop ecommerce template for Animal Shop and would like to protect my content by copyright, can I place Copyright, Mycompanyname.com? After PrestaShop ecommerce template for Animal Shop purchase you can put your copyright to the template. But you cannot place a line at the bottom (or any other spot) of the customized project saying "Website design by Company name". Nevertheless, you can place "Customized by Company name". What is a one time usage license for a PrestaShop ecommerce theme for Pet Accessories Shop? When you buy the PrestaShop ecommerce theme for Pet Accessories Shop at usual price you automatically get the one time usage license. It enables you to use each individual product on a single website only, belonging to either you or your client. You have to purchase the same template again if you plan to use the same design in connection with another or other projects. When passing files to your client please delete the template files from your computer. Can I put a line at the bottom (or any other spot) of my new product "Website development by Company name" after purchasing PrestaShop ecommerce template for Animal Shop? Yes, you can place a note at the bottom (or any other spot) of my product "Website development by Company name". Nevertheless, you cannot place "Website design by Company name" while using one of PrestaShop ecommerce template for Animal Shop. Are there any restrictions for using imagery, cliparts and fonts from the PrestaShop template for Pet Boutique I purchased? All imagery, clipart and fonts used in PrestaShop template for Pet Boutique are royalty-free, if not stated otherwise on the product page, and are the integral part of our products. One Time Usage License and Developers License give you the right to use images, clipart and fonts only as a part of the website you build using your template. You can use imagery, clipart and fonts to develop one project only. Any kind of separate usage or distribution is strictly prohibited. Can I integrate the PrestaShop ecommerce template for Pet Store with third-party software or applications for development of my new products? No, you cannot get the developers license for development of PrestaShop ecommerce template for Pet Store or other products. Can I contact the Online Pet Shop PrestaShop template author? Yes. You can contact this Online Pet Shop PrestaShop template author/author's team directly using your personal account under the Support tab. 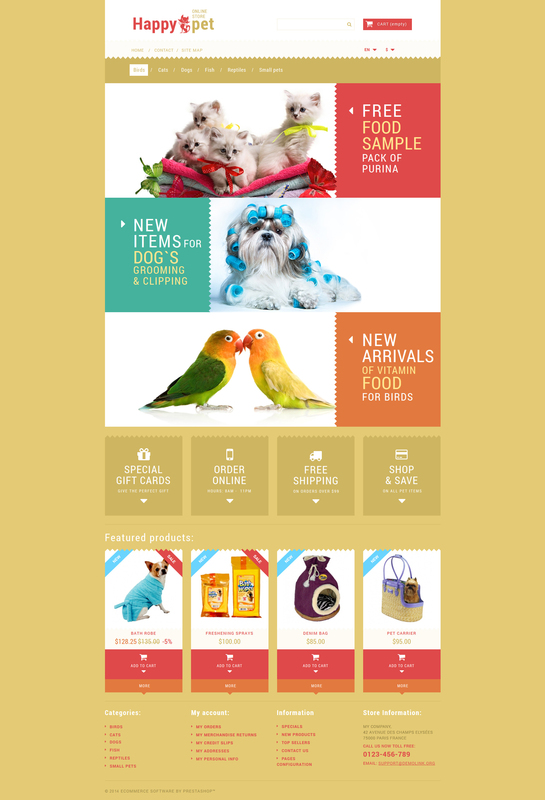 Can I use graphics from Pet Food Store PrestaShop design theme I purchased for use in printing? Yes, it's not prohibited to use the Pet Food Store PrestaShop design theme graphics for printed material, but the resolution of the templates graphics ( except for logo templates) is not enough for printing. Will TemplateMonster help me to install my PrestaShop theme for Pet Accessories Store? Some of our products like osCommerce templates, Zen Cart templates, etc. require installation to operate. Installation services are not included in the package price. TemplateMonster though offers you a variety of sources to help you with installation of your PrestaShop theme for Pet Accessories Store including installation instructions, some articles with our Online Help Center. Our Knowledgebase contains customers questions and most frequent problems. Anyway, you can always refer to our partners from TemplateTuning.com to install your PrestaShop theme for Pet Accessories Store for you for a small fee. What is Developers License for PrestaShop ecommerce template for Animal Store? If you purchase a Developer's license, you are granted a non-exclusive permission to use the PrestaShop ecommerce template for Animal Store on up to 5 domains for projects belonging to either you or your client. How many applications, programs etc can I use to integrate with the PrestaShop ecommerce templates for Online Pet Shop under one extended license? The extended license gives you the right to use the purchased PrestaShop ecommerce templates for Online Pet Shop for the integration with one software/freeware/application/CMS/sitebuilder only. In case you would like to use the template with the other application, the other license is to be acquired. I would like to make payment for PrestaShop template for Pet Shop by company check. Is that possible? Please use Skrill payment option. They accept payments by check.You can place an order for PrestaShop template for Pet Shop on the site under the name of the company and choose Skrill merchant system for making payment from the company's account. To initiate bank transfer, please create an account here - www.skrill.com, add the number of your bank account and verify it. After that, you can place an order on our website and choose Skrill on checkout page. When the payment is made, the product will be sent to your e-mail along with the invoice under the name of your company. Can I customize the Pets Supplies PrestaShop ecommerce theme if that's required by application settings? Yes, you can customize the Pets Supplies PrestaShop ecommerce theme code, graphics, fonts to any extent needed. Will TemplateMonster help me to edit my PrestaShop ecommerce theme for Online Pet Shop? TemplateMonster offers you a variety of sources to help you with your PrestaShop ecommerce theme for Online Pet Shop. Use our comprehensive Online Help Center to get the basic knowledge about your PrestaShop ecommerce theme for Online Pet Shop. Our Knowledgebase contains customers questions and most frequent problems. Anyway, you can always use TemplateMonster 24/7 phone support, try our Ticket System or Live Support Chat to get qualified assistance from our support representatives.